We began this journey in May of 2016 with the trademark of our “identity.” We then traveled to the Philippines to explore the land of our ancestry, and though we found the islands make up a part of who we are—they did not define us fully. In the US they call us Filipino, in the Philippines, they call us American. We exist in this in-between of identities, always looking one way or the other. But on this long journey, we learned that we are the product of our parents’ struggles. The product of our creative adventurous parents, who left the Philippines to expand and grow their islands—to create their own culture and identity in this Pacific Northwest land that we call home. Together, along with so many others, our experiences have shaped this region. We and the land are synonymous. We are here and now, we are Filipino Americans. Our chef, Aaron Verzosa, is a Filipino American Chef born and raised in the Pacific Northwest. After graduating from the University of Washington, Aaron attended the Seattle Culinary Academy while working in the Basque focused Spanish restaurant- The Harvest Vine. After leaving the restaurant, Aaron joined the Modernist Cuisine (MC) team lead by Nathan Myrvohld in 2010 working as an R&D Chef there for over five years. During his time with MC, Aaron had the opportunity to travel to Paris to stage with Michelin starred Chef David Toutain as a means to understand the Modernist approach within the lens of French gastronomy. 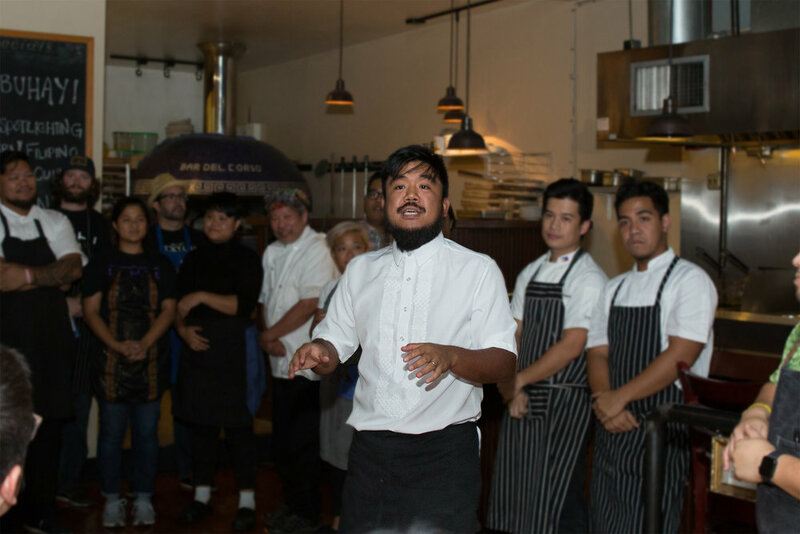 Aaron has been engaged in the Filipino American community for many years, and is presently working on empowering Filipino businesses as a cofounder of ILAW: A Coalition of Filipino Food & Beverage Professionals in the Pacific Northwest. Now, Aaron is both excited and deeply passionate to marry his love for the craft of cooking with the flavors of his Filipino roots. Amber Manuguid is a Bremerton-born, Silverdale-raised, Seattle-based artist and designer whose focus is creating joyful and meaningful experiences. Over the past 10 years she's worked on creating experiences for a variety of companies including Nordstrom, Random House, Amazon, Microsoft and Mattel and received an Honorable Mention from Fast Company’s Innovation By Design Awards. She also is an active contributor in Seattle's Filipino American community providing her design skills to local organizations such as ILAW, the Filipino Community of Seattle's STEAM Youth Program, the Seattle Asian American Film Festival, Kalsada Coffee, and Pista sa Nayon. She studied at Parsons School of Design in New York and is a graduate from the University of Washington. Amber manages and designs the in-restaurant experiences for Archipelago.